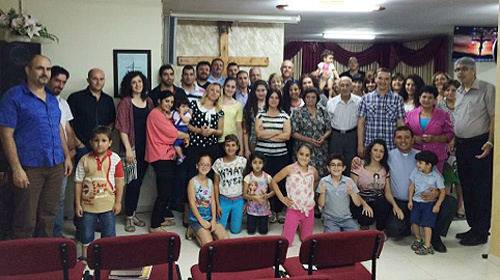 After an initial visit to Israel by Stephen Plummer (former Senior Pastor) in 2000, then by a larger group from the church in 2008, Ampthill Baptist Church has established a vibrant twinning relationship with Shefa'amr Baptist Church. 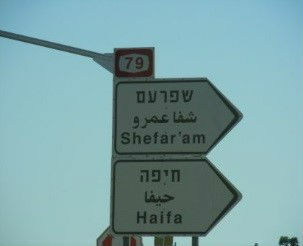 Shefa’amr is a few miles from Nazareth, in Galilee, Northern Israel. It is our aim to pray for and support this small Christian community as they live out their faith and reach out to those in their local area, and to encourage one another as two churches in very different situations. 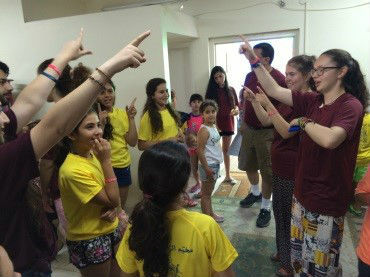 Our hope and experience is also that this broadens ABC’s appreciation of global issues, gives us a wider cultural perspective, and helps us to learn from Christians facing difficult challenges, as well as bringing encouragement and support to the minority group of Arab Christians in Israel. 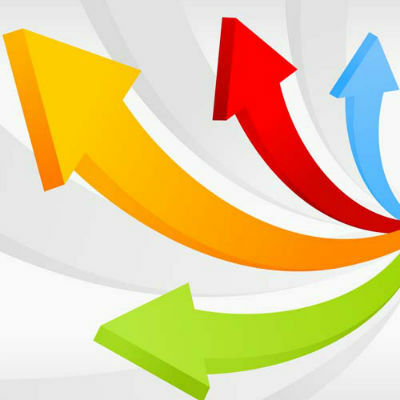 We have particularly sought to strengthen and deepen our relationship through regular visits to and fro, some of which are highlighted below. As part of our twinning, we support the work of Baptist Twinning in Israel, a group which was developed by the Central Baptist Association. 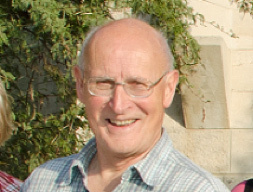 Andrew Goldsmith has been one of the Trustees of BTI since October 2014. ABC members visit Shefa’amr during a group trip to the Holy Land. In May 2017, Rev. David Ronco led a group of 26 people from 15 churches, coming from across the UK, on an introductory tour of the Holy Land. Andrew Goldsmith was the co-leader, and Alan and Claudia Tyson from ABC were also in the group. The 9-day tour included several days in the north, based in Nazareth, and a few days in the south, based in Jerusalem, visiting biblical sites, ‘walking in the footsteps of Jesus’, meeting local Christians, as well as sharing in worship and fellowship in different venues. As part of this, we had an evening with Pastor Nader and his family, and shared in their Friday evening worship service in Shefa’amr. 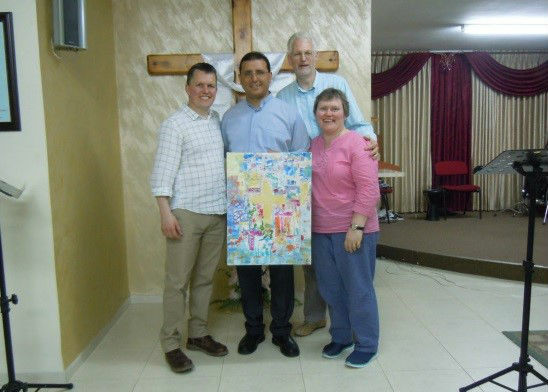 Andrew preached through a translator, we prayed together, and we presented the church there with a beautiful, vibrant collage based on the cross as a gift from ABC. They were delighted by our visit, and we appreciated meeting them, the encouragement of all that the Lord is doing, and strengthening our link once again. 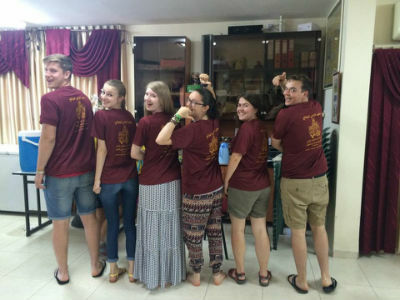 A group of 6 young people from ABC led by Martin Sutch spent a week with the church in Shefa’amr. They stayed with various families, enjoyed the wonderful hospitality, and supported the church’s holiday club for local children. This was the ‘typical’ range of noisy games, songs, games involving water, Bible stories and lots of fun. They also had time with the church family, and seeing sights in Galilee, Jerusalem and Bethlehem. It was an unforgettable experience, and made a big impact on the group as well as very positive for the ongoing twinning relationship. You can read more about the trip HERE. In July 2015, Martin had the opportunity to spend 8 days in Israel, particularly to visit our friends in Shefa’amr. 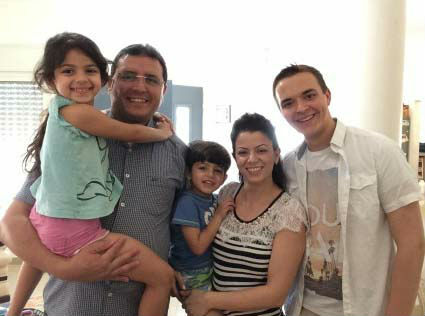 He stayed with Nader, Noura and family, and met several members of the church as his ‘tour guides’ and hosts. It was a very valuable time sharing with their youth leaders, with opportunity to talk about challenges, priorities and opportunities in youth work. 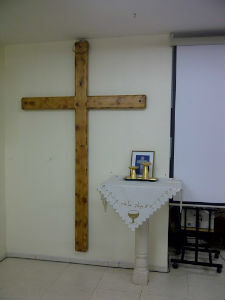 Martin also took part in their Friday service, sharing greetings from ABC. 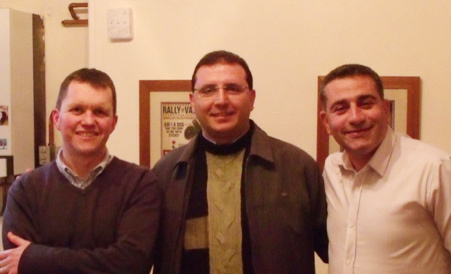 In January 2015 we held a celebration meal at ABC with Israeli food. Over sixty people came and took part in a Skype conversation with friends from Shefa’Amr Church: Nader and Noura, Monther, Rawan and her father. Revd David Ronco spoke on the encouragements and challenges for Arab Baptist Churches and Christians in Israel. We also had a couple of quizzes, a photo display, and were reminded of the encouraging and exciting story of our partnership between the two churches. It was particularly moving to pray with one another, live via skype! After attending a conference in the South of England, hosted by the BU, Pastors Nader and Hanni, end their time in England by visiting Ampthill for a weekend. Andrew also enjoyed the opportunity to meet up with Nader again and welcome Hanni, and they had some useful time discussing preaching plans and approaches to discipleship. Rawan Sabbah of Shefa’amr B.C. visited Ampthill for a week, experiencing some cold weather! Chris and Andrew had met Rawan on their visit the previous summer. She worked with the young people of the church as a youth leader. During her time with ABC she met our youth group, some of the young adults, came to a prayer breakfast, and joined us in the morning service where she shared news and brought greetings.